Bell+ is a lamp that confronts our usual perception of lamps as something static. Thomas Holst Madsen has designed a contemporary lamp which is ideal for use in restaurants, cafés, hotels, retail stores, conference rooms and private homes. 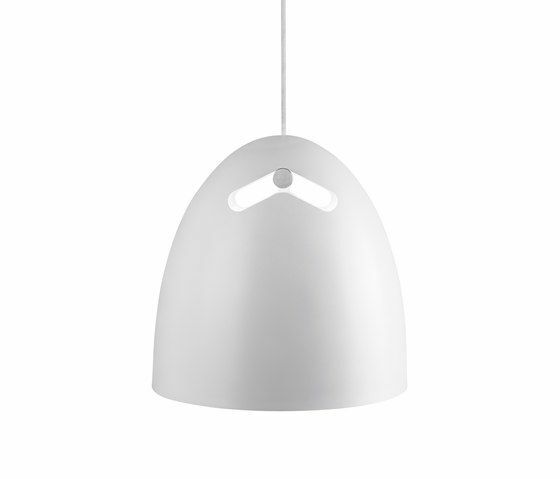 The simple suspension, the implementation of a bar on which the shade hangs and the addition of the tilting function has created a unique lamp. The distribution of light is essential to the design and the lighting effects generated through the sides and top of Bell+ were important design features from the beginning. Bell+ is more than a lamp!